Combine a love of animals with a keen eye for detail, and you get the lively watercolor paintings of artist Sally Walsh. 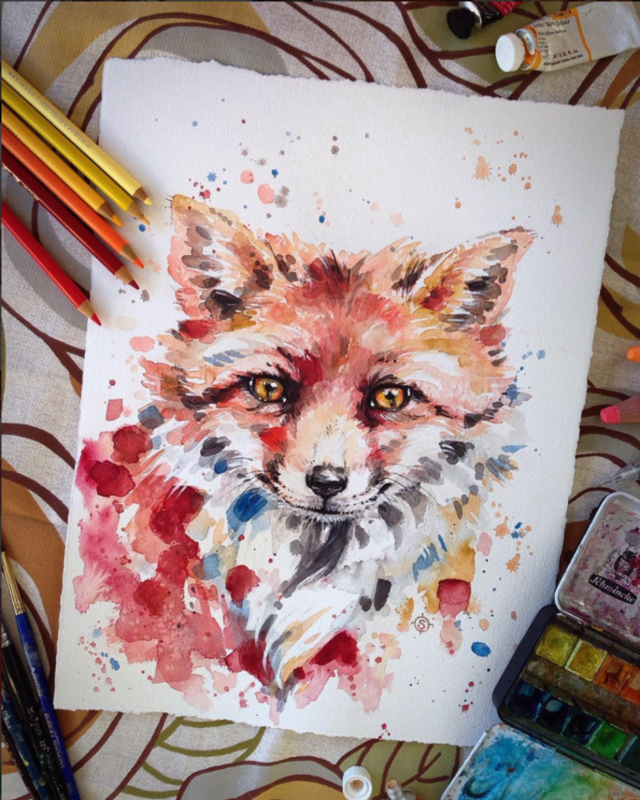 From inquisitive foxes to friendly birds, her work showcases a playful style that captures each animal’s unique personality in a refreshing way. 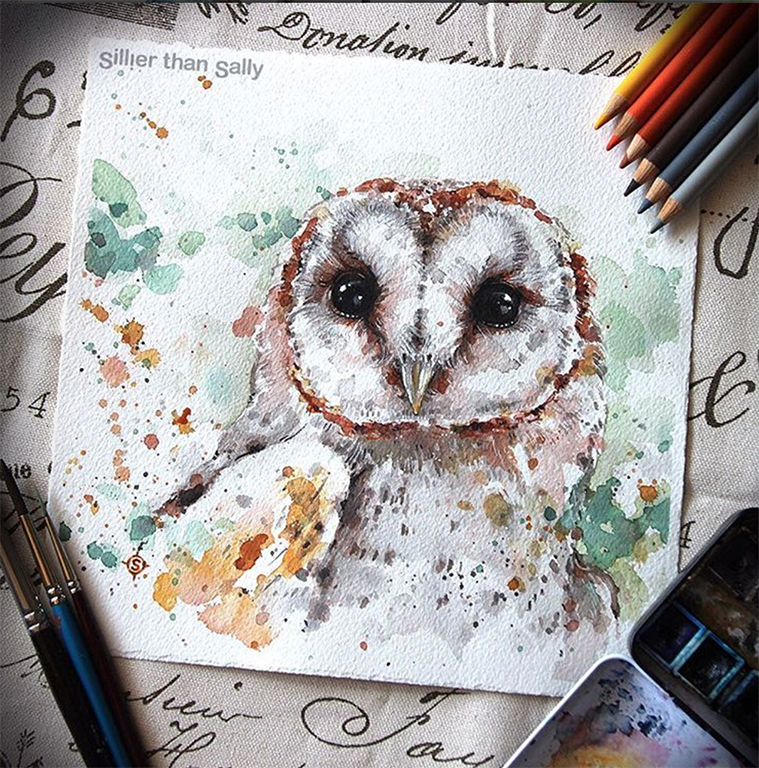 Sally tells us her passion for painting wildlife comes from the feeling she gets being in and around nature. “I have always felt at such ease around animals, like that connection energizes my soul.” As you admire her art, it’s easy to see the relaxed, fluid link that exists between Sally and her subjects. 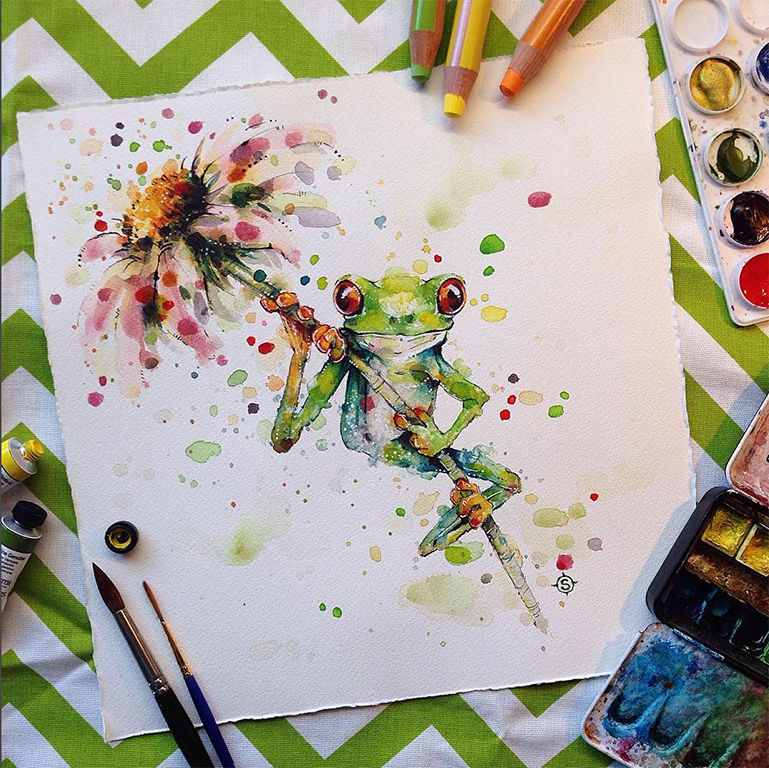 After her son was born, Sally decided to give watercolors a second chance. “I could walk away from my pallet and attend to a crying baby, and not worry about all my paints drying out,” says Sally. 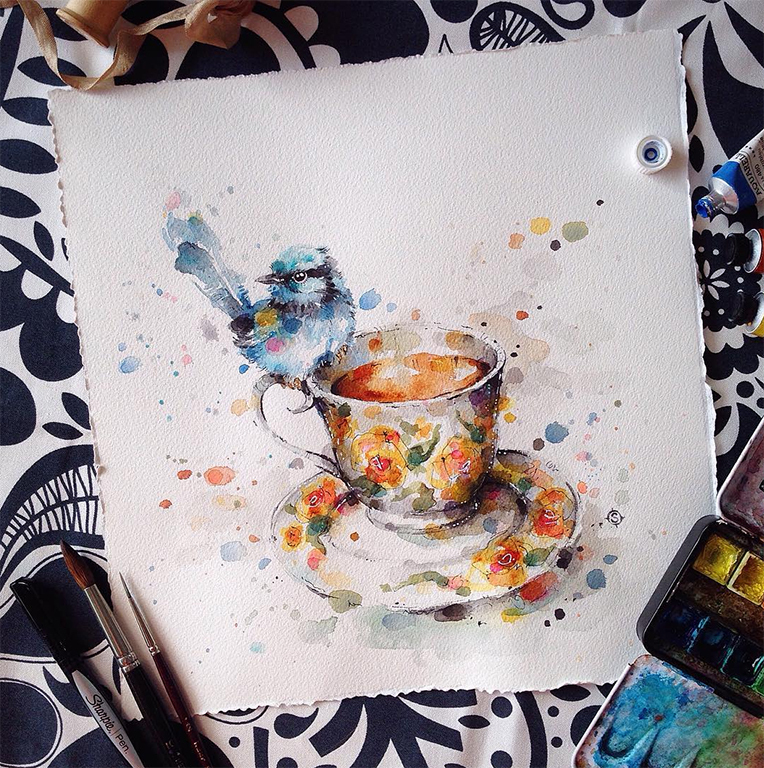 To build her skills, she gave herself a challenge: paint a watercolor piece every day for a month. After finishing the daily portrait, she’d post it to her Facebook account. The results were beyond belief. Within seconds, her painting would be sold. Sally tells us this was her watercolor breakthrough. “About 15 paintings into my first challenge, I felt a change happen. 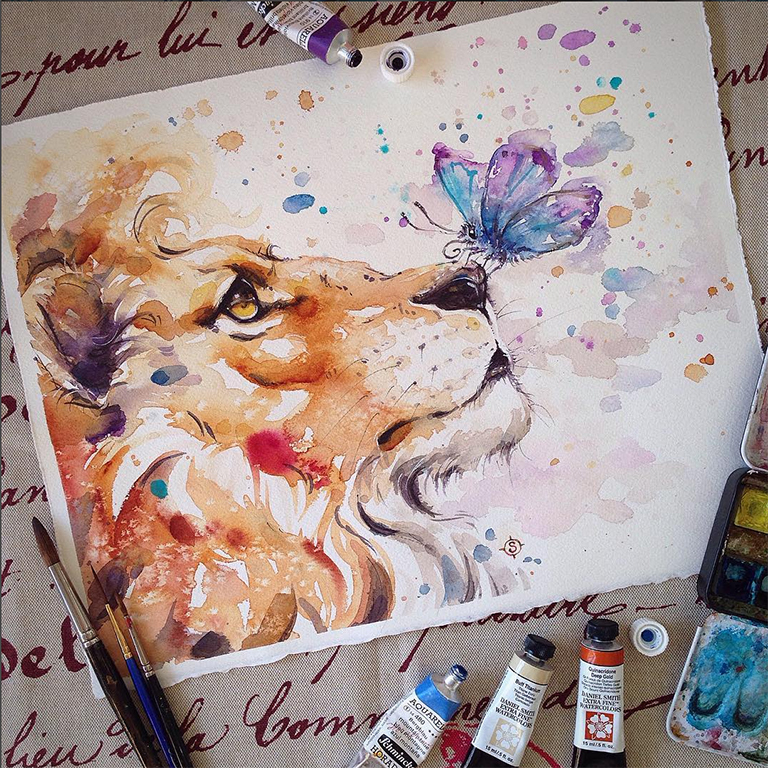 [It was] like the watercolors and I had become a team, and that we worked together on a piece. I stopped trying to control the watercolors—like I did with acrylics—and found that was where the magic happened,” says Sally. No longer at odds with the medium, her whimsical aesthetic evolved naturally. “Without almost realizing, I was developing a unique style,” says Sally. 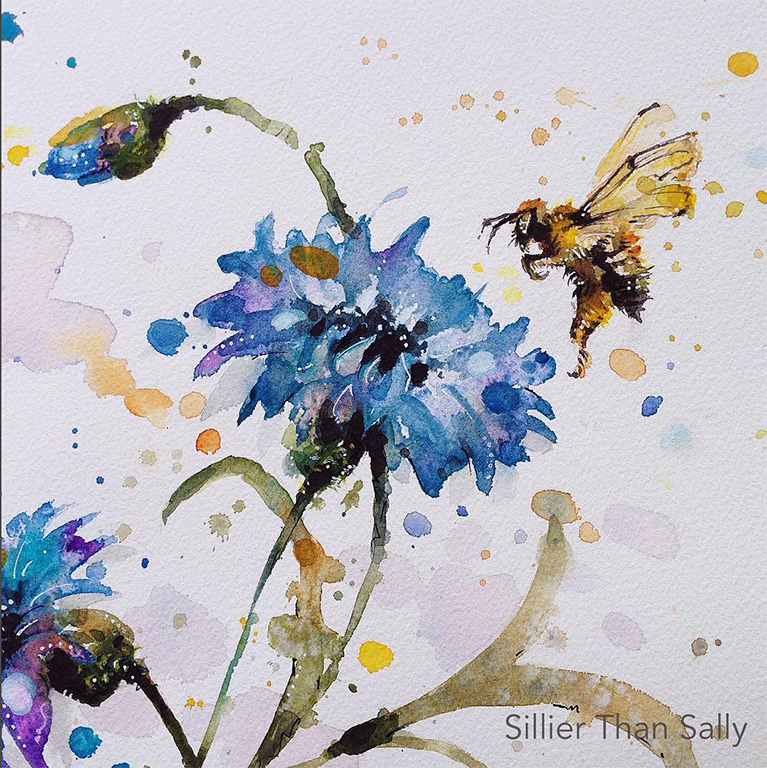 Whether she’s portraying a light-hearted bee hovering above a corn flower or a majestic lion with a delicate butterfly perched on his nose, Sally’s work magically flows between the wild and innocent sides of her subjects. As you scroll through the vibrant paintings on Sally’s Instagram, @sillierthansally, it’s no surprise to learn she has worked as a graphic artist on high-profile advertising campaigns and on the animation team at Disney. The wide-eyed deer below is reminiscent of a playful Bambi. 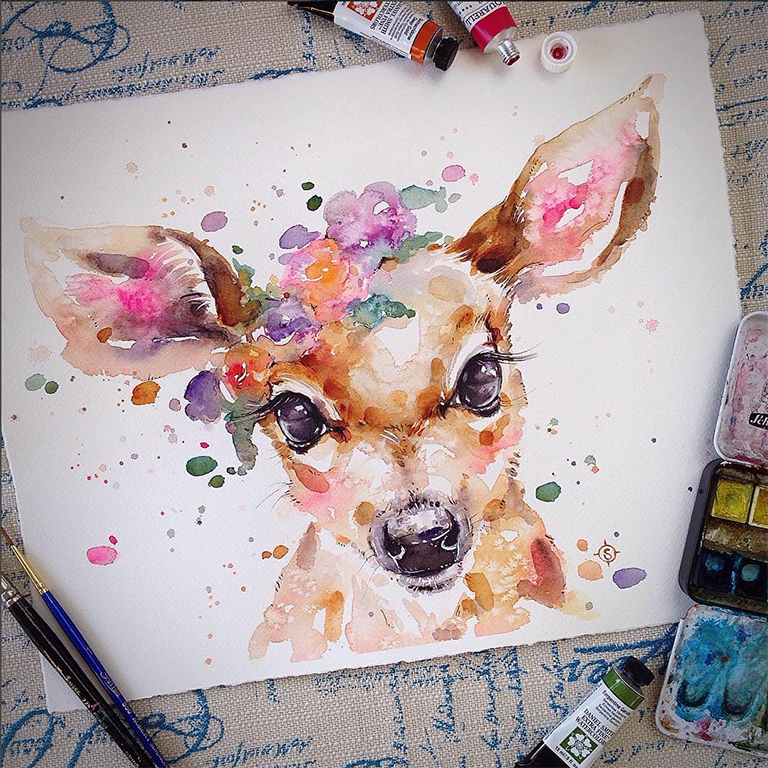 When Sally’s not sitting down to capture her latest animal encounter, she also creates incredible portraits, botanical illustrations and mixed media pieces. To discover more of Sally’s work, take a look at her website or follow her on Facebook.